I have a certain fondness for "Front Page Drama", the long-running quarter hour program syndicated by Hearst Newspapers from the 30s well into the 1950s. The shows can be wonderfully sensationalistic and odd, but is short enough to not wear out its welcome. I recently obtained a cache of "Front Page Drama" discs from the 1930s, probably the best period in the show's history, and will drop in a few now and again. Program 168, distributed for broadcast the week of July 11, 1936, is "Mrs. Dodd's Defense", adapted from an "American Weekly" article titled "Wives Mustn't Shoot Their Husbands". It's a little piece that paints defense lawyers as pretty shady characters and has a passionate murder to give the story some tabloid appeal. The show was transferred from an original Langlois & Wentworth, NYC/Hearst Newspapers Victrolac transcription pressed by RCA, matrix number MS 102185-1. Now a fascinating little oddity that had me doing a double-take. The "Chesterfield Supper Club" was originally broadcast on NBC and featured vocalist Perry Como. I had seen listings for this show around for years and never really paid much attention to it until I ran into this episode. 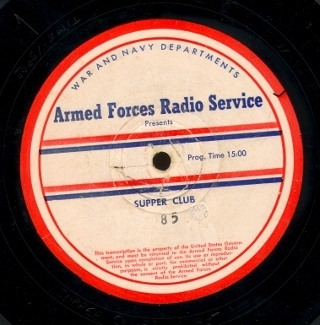 Program 85 of the series as it was broadcast on the Armed Forces Radio Service as "Supper Club", was originally heard on NBC on May 23, 1945. The program is done in the style of a minstrel show, with Como singing the opening tune, "Mammy", and trading jokes an Interlocutor with Blackface comedians "Pick and Pat", who we heard in a their own series on the blog a few months back. The show also features Martin Block, The Satisfiers, Mary Ashworth and Ted Steel and His Orchestra. Pick and Pat were regular guests on the series during a certain period, so this wasn't a "one off". It's a little cringe-worthy to think about the cool smooth Como belting out minstrel tunes on a regular basis. Oh, the things that tobacco companies would get performers doing on the radio. I'm glad that Perry Como's career recovered from this series - he's a real pro to hang in there and pull it off. 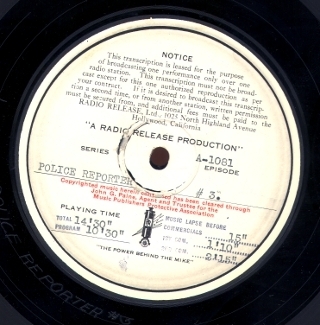 The show was tranferred from an original AFRS vinyl transcription. The date is in the disc matrix. Note: This program contains language and racial stereotyping themes that may be offensive to some listeners. Now, the third program in the previously lost and uncirculated early 1930s syndicated series, "The Police Reporter" that we'll be running through over the next few months. The true crime case in program 3 is the so-called "Georgia Slave Murders" that occurred in 1921 in Atlanta. A man keeps and abuses Black men as slaves in a compound and kills all them when word gets out to the police. This disturbing case was the subject of a 1999 book, "Lay This Body Down: The 1921 Murders of Eleven Plantation Slaves" by Gregory A. Freeman. You can also read a summary of the real case on this forum post. 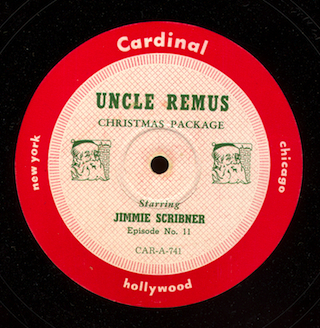 The show was transferred from an original Radio Release, Ltd. shellac transcription pressed by Allied Recording in Hollywood, matrix number A-1081. Next week: a case of murder from Paris. This program contains racial stereotyping themes that may be disturbing to some listeners. Technical note: If this file sounds "off speed" in the on-screen player, try the Download option and listen to it directly on your computer. This is a bug with Flash in playing some mp3 files encoded at particular rates and only affects some browsers and versions of Flash. I've debated about putting up this program. However, it is historically significant and should be available to old time radio researchers and historians. If you decide to give it a listen, keep in mind that it's a difficult half-hour due to the sound quality and the content. "Plantation Echoes" was an early syndicated program from Transco. Goldin lists one other episode in the series (program 13) and dates the series to 1932, but I'm not sure of the source of his information. The show features a Black cast performing spirituals and popular songs that are framed by an ongoing story set on an "Old South" plantation. Program 9 in the series picks up the story from the previous week where Liza has gone missing. The slaves, through a series of misunderstandings, think she's been murdered. Several Transco series from the 1930s were repackaged and syndicated by Bruce Eells and Associates when they bought the Transco library in the 1940s. "Plantation Echoes" hasn't appeared on any of these later vinyl repressings, so it perhaps it shelved because it would have sounded pretty dated a decade later. Or perhaps it didn't do that well in its initial run. I took a look through several sources - newspaper archives in ProQuest and Google Books and JJ's Radio logs - but only turned up one definate program with that title from 1932, a fifteen minute program on KMTR running 15 minutes. There was a program titled "Plantation Echoes" that featured Ethel Waters on NBC in 1934 according to several sources, but I don't think the two shows are related. The NBC effort would have originated in New York where Ethel Waters was having considerable success on the theater stage; as a syndicated Transco program, our "Plantation Echoes" program would have likely been recorded in Hollywood. The style of the disc pressing - laminated shellac - leads me to think it dates from as early as 1929 or maybe as late as 1933 or '34. Unfortunately, when the disc was shipped to me, it was broken into three pieces. So I reassembled the disc and tried my best to do a transfer and edit it into something listenable. I played the disc in sections, constantly shifting the tonearm weight and anti-skating and replaying sections to get it to track as best as I could. However, there are still several skips in the show opening, at the end of side one and the beginning of side two. The edited file was run through some heavy click reduction to minimize the pops and clicks as much as possible. At least, it can give you an overall idea of the program contents even if it is difficult to listen to at times. The previous owner of the disc, who had it in his collection since 1977, never played the transcription or had a transfer made, so this is likely all we have left of this particular show unless a 1960s or early 70s tape of the disc pops up somewhere. I'll leave it to others more familiar with African-American history to remark on the cultural content of the program. As far as my knowledge of old time radio goes, it's rare to hear all all-Black or mostly-Black cast featured on a series from this time period. I can't recall any other series where African-Americans were playing stereotypes like these for comedy - whites playing Blacks in character, like Amos n' Andy, or recreating minstrel routines, like Pick and Pat, were much more common on radio at the time. One odd thing that perhaps a listener can confirm or comment on - at around 16:30, in the number "Ain't It a Shame", it sounds like the bass singer keeps singing the line as "A G*****n shame" after the first chorus or two. Am I hearing that right? The program was transferred from an original laminated shellac Radio Transcription Company of American transcription, matrix numbers R-214 and R-215. "Globe Theatre", hosted by Herbert Marshall, was a half-hour AFRS drama series that drew on recordings of shows such as "This is My Best" and preserving some rare material. Program 166 in the series was originally broadcast on "This is My Best" on September 19, 1944 on CBS. We hear an adaptation of Gerswhin's "Porgy and Bess" with many members of the show's original cast. Heard on the program are host Herbert Marshall, William Franklin, Etta Moten, Warren Coleman, Edward Matthews, Avon Long, Georgette Harvey, Harriet Jackson, Alma Millie Hubbard, and the Eva Jesse Choir. The broadcast was produced and directed by Norman Corwin. The show runs a little short so we hear an excerpt of next week's program ""The Odyssey of Runyan Jones" by Norman Corwin. 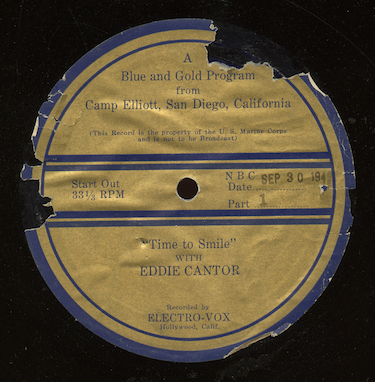 The program was transferred directly from an original AFRS Navy Department vinyl transcription. The date is from the disc matrix. We come to the end of a series of excerpts from the CBS series "Pick and Pat", featuring Blackface comedians Pick Padgett and Pat Malone. The shows were recorded for the producer of the series and turned up from an estate sale a few months ago. This excerpt, part of 2 of a program originally recorded in three sections, has Pick and Pat doing a routine about poetry. "I Married an Angel" is played by saxophonist Benny Kruegar and the orchestra and tenor Edward Roecker sings "The Girl in the Bonnet of Blue". The excerpt would appear to be from sometime in 1938, based on other discs in the series from this collection. The show was transferred from original WABC aircheck lacquer recorded by Advertiser's Recording Service, New York and was previously lost. Here's the next to last excerpt of the CBS series "Pick and Pat" in my collection, drawn from a set of discs produced for the series producer, Frank Macmahon. This is part two (of three parts) of an undated show from 1938. Pick and Pat's routine is about appearing in court because one of the pair is accused of stealing chickens. The band plays "There's a Far Away Look in Your Eyes" with a solo by Benny Krueger. Edward Roecker sings "Did Your Mother Come from Ireland?". The excerpt of this otherwise lost show was transferred from original WABC aircheck laquer recorded by Advertiser's Recording Service, New York. Here's another excerpt from "Pick and Pat", a program featuring blackface performers Pick Padgett and Pat Malone, two Irishmen who teamed up in 1929 as Molasses and January and had their own network show from the early 1930s through 1945. The shows in this series I'm posting on the blog are from rare aircheck discs that were created for the shows producer, Frank Macmahon. The programs from this group were heard on CBS and sponsored by Dill's Best and Model tobacco in 1937 and 1938. This week, we hear part 1 (of three parts) of the program of December 12, 1938. Unfortunately, the disc containing part 2 of the show is missing and the flipside of this disc, part 3, was damaged and I was unable to give it a transfer to digital. The recording starts off with the end of the previous show on the network and the WABC id. This particular episode, unlike the others I've posted on the blog, is billed as "Model's Minstrels" and is formatted more like a traditional minstrel show. he male chorus sings "There's Gonna Be a Great Day". Pick and Pat read letters they've received, including one from "Shorty" wanting advice about his farm. The date on the label is obscured, but the flip side of the disc contains part 3 of the show. Unfortunately, the disc has extensive cracking of the lacquer and I couldn't play it well enough to transfer, but I did hear the opening of the December 12, 1938 episode of "Lux Radio Theater" ("The Scarlet Pimpernel") to date this "Pick and Pat" episode. The program was transferred from original WABC aircheck laquer recorded by Advertiser's Recording Service, New York. This is a previously uncirculated episode of this rare series.